Philadelphia Eagles coach Doug Pederson. For better or worse, the Philadelphia Eagles' Week 1 starting quarterback is most likely not one of the guys currently under contract for next season. And with the NFL Scouting Combine getting underway in Indianapolis, the free agency period set to begin on March 9th, and the draft not long after that, first-year coach Doug Pederson will have a chance to find his guy -- whether that's drafting a rookie for the former QB to groom himself or re-signing Sam Bradford, who went 7-7 in 14 starts under Chip Kelly last season. On Wednesday, Pederson spoke to the media from the Combine, just over a month after being introduced as the franchise's 23rd coach. And again, he said he'd like to have Bradford back for a second season in midnight green. Pederson also said that the team plans on speaking with Bradford's agent, Tom Condon, while both are in Indy for the combine, a sentiment echoed by general manager Howie Roseman just a few moments later, during his session with the media. Whether or not they'll be able to reach an agreement on a new deal to keep the former top pick and Heisman winner in Philly for next season remains to be seen. A lot of that will come down to price, a number that could be greatly influenced by Bradford's strong second half of last season. Over his final seven starts, Bradford completed over 68 percent of his passes for 1,959 yards (280/game and 7.59/attempt), 10 touchdowns, and just four interceptions (97.0 passer rating). The team was also 4-3 in those games, with two of their losses coming against playoff-bound teams (Arizona and Washington). But those numbers weren't the thing about Bradford's season that most impressed Pederson. That's the quality it seems Pederson, who spent several years backing up Brett Favre, seems to value most in his quarterbacks. And it even applies to the young crop of quarterbacks -- including Paxton Lynch, Carson Wentz and Jared Goff -- he'll be evaluating this week at the combine. 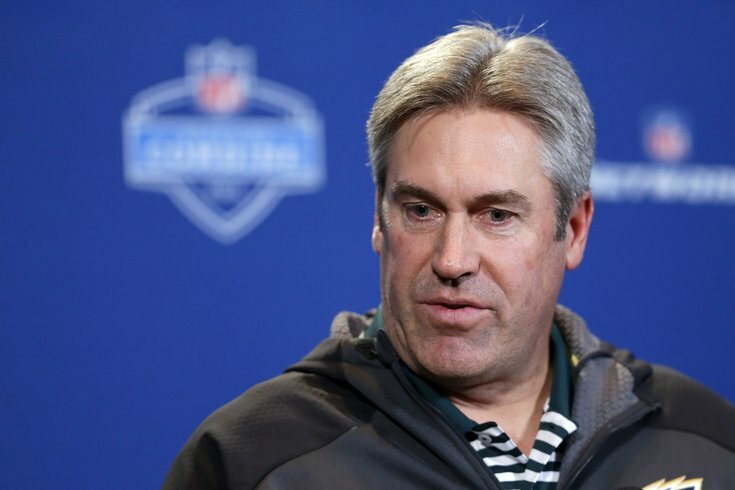 “I think this is a talented group [of QB prospects]," Pederson said. "I think it’s a group that is -- we all know what they can do on a football field, and that goes without saying. I think for a lot of us, and for most of the teams here that are looking for quarterbacks and obviously this one, it’s how can they come into your organization. However, Pederson won't be the guy making the final decision on personnel. That responsibility again belongs to Roseman, who spent last year watching Kelly mismanage his way out of a job. When it comes to the all-important quarterback position, Roseman seems more than willing to defer some of that judgment to his top football minds, several of whom are former quarterbacks themselves. Still, when the draft rolls around on April 28th, Pederson will be much more involved in the process than he was in Kansas City, where Andy Reid and others would "pick my brain on a player they would and get my insight on a player." "This year, I’ll obviously be a little more involved in the selection of players," he added when asked how this year will be different. "You know, with Howie in the room and having the pro personnel there and having Jim Schwartz as the defensive guy or Frank Reich on offense, position coaches, you’ve got a lot of information nowadays to help you make the best choice. "We’re all going to be part of it and it’s a collective effort and I’m just looking forward to that process going forward." If the Eagles don't re-sign Bradford before he becomes a free agent on March 9th, they'll be left with backup Mark Sanchez as the de-facto starter until they draft someone. But whether it's Bradford or a rookie, Sanchez isn't likely going anywhere. As we've seen in recent years, many quarterbacks struggle to make it through an entire season without missing at least one start. And like Kelly before him, Pederson believes having a capable backup is extremely important. That's a great cushion to have. But you need to have a starter first.